I don’t remember if we made this the first time because we had plums, or if we bought plums to make it. But I can definitely tell you the second time, we definitely bought plums to make it. I had another recipe for this week, but I was hoping to get this one out before the plums were completely done for the season! I’m kind of ambivalent towards plums. I’ve got nothing against them, but I don’t usually feel like sitting down and just eating a plum, you know? HOWEVER, it turns out that if you put them in a CAKE, that’s a whole different story. I received a note from Amanda Hesser over the weekend giving me a heads-up that the 1 tablespoon listed in the Essential New York Times Cookbook was actually a typo, and should have been 1 teaspoon. In fact, the very original version in the Times had 1 tablespoon too, but all of the future ones had only 1 teaspoon, suggesting that it had been a typo there too. Having made the 1 tablespoon version (repeatedly), I can tell you that I wouldn’t have it any other way. It is a lot of cinnamon, and I wouldn’t have thought cinnamon + plums = magic, but in fact, cinnamon + plums = magic. I feel like this is a fancy-pants dessert that you could impress with at a party, and yet it is so delicious and easy to make, so you won’t mind just making it for yourself at home. It is also the only dessert I know where you can literally PUT IN YOUR THUMB AND PULL OUT A PLUM. That’s got to count for something. Sift or whisk together flour, baking powder and salt in a medium bowl. In a larger bowl, cream butter and 1 cup sugar together with an electric mixer until fluffy and light in color. Add the eggs, one at a time and scraping down the bowl, then the dry ingredients, mixing until just combined. Spoon batter into a greased, 9-inch springform pan and smooth the top. 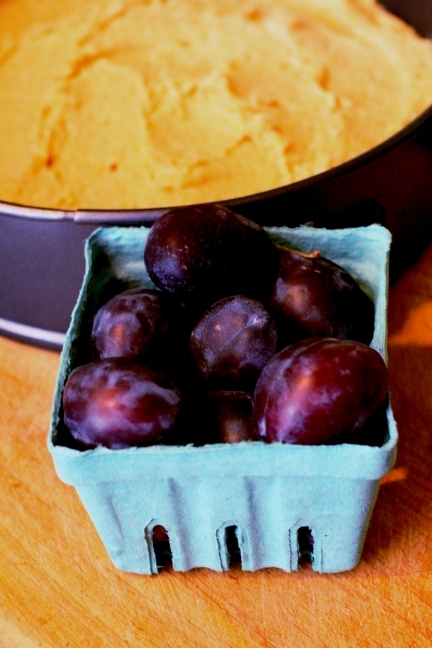 Arrange the plums, skin side up, all over the batter, covering it. Sprinkle the top with lemon juice, then cinnamon, then remaining sugar. Leave it covered at room temperature overnight.